As a professional Krav Maga coach I am often approached by Krav Maga Instructors or students for drills to improve or speed, fluidity or technical proficiency. One of the most effective, yet most overlooked training methods is slow fighting. To be clear, slow fighting is NOT sparring. Sparring is a pre-agreed set of techniques performed in the format of what is essentially a game or match. This is a distinct and separate process to slow fighting. Slow fighting is exactly that - slow fighting practice over a range of scenarios designed to replicate real violence. Training is slowed down to allow time for skill acquisition or behavioural modification. It is critical that slow fighting reinforces desirable behaviours such as the use of simple effective combatives and is NOT used to train movements that would be unlikely to work at full speed and power. The many Systema videos on the net should be a warning to Kravists - slow fighting should be simple and realistic, not an opportunity to introduce questionable or impractical techniques. Slow fighting could entail an attacker escalating from verbal to physical attack, use of a weapons attack midway through training or combine weapons with multiple attackers and different scenarios within the same drill. This is markedly different from an agreed exchange of techniques using strikes and grappling between 2 people. At more advanced levels slow fighting would involve Krav Maga practitioners disarming a weapon and using that weapon effectively on subsequent attackers in a slow but realistic manner. Slow fighting should always encourage Krav Maga practitioners to apply good strategy and tactics from a Self Defence perspective. When coaching a student, or training to improve personally the first thing to consider is what are my goals - what do I hope to achieve, what will it look like and how will I know when I get there. A simple measure of a Martial Arts Instructors’, (A Krav Maga Instructors too..) competency, is how they introduce sparring or fighting practice. As discussed previously, slow fighting and sparring are different but bear with me here. A poorly trained Instructor will introduce pressure to early, or increase complexity of attacks too quickly for the student to benefit from the training. Because the student has not already established the correct functional movements required to protect themselves or strike effectively, they quickly establish long term flinching or undesirable habits from the process of negative conditioning. The more stressed they get the stronger the reinforcement of undesirable habits that make them more vulnerable to a skilled opponent. These reinforced habits could take a skilled coach months or even years to undo. In Krav Maga, poor coaching is not only a waste of time and resources, it is a positive disadvantage to the recipient if they wish to progress. The solution to this problem, is the use of slow fighting. It is vital the Krav Maga Instructor develops a community based around developing from mistakes. 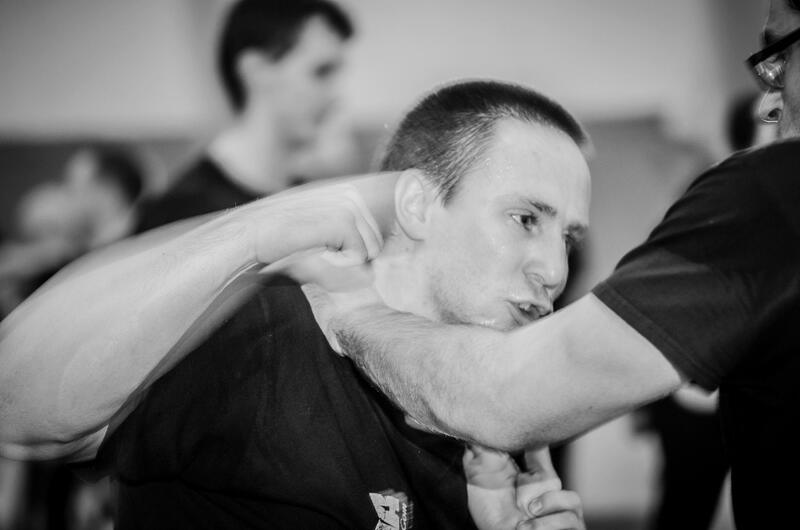 Getting hit in any realistic scenario is inevitable, whether ‘the hit’ is blocked, evaded or landed, the Krav Maga student must learn to cope and not panic. The worst possible reaction is to stop everything as you’ve just been hit. This reinforces a dangerous reaction to pain - to give up immediately. Slow fighting then, is the very basis of stress inoculation and the perfect place to lay down these fundamentals. Micro fighting is a methodology where a very limited amount of techniques are used, or a limited set of scenarios are used. This enables Krav Maga practitioners to learn or correct habit by being repeatedly exposed to a threat or problem they are struggling with. Training is slowed right down until the Krav Maga student can correctly deal with the technique. Then the attack is repeated faster and faster constantly coaching to success until the Kravist can deal with the technique at real speed. It is important to understand that coaching success may occur in a single session, a week, or a month depending on the complexity of the scenario - but irrespective of time span - the process remains the same. Once this is achieved the technique can be slowed down and mixed in with multiple other scenarios and gradually speeded up until again the Kravist can use the technique realistically. Excessive tension causes inefficient and slow reactions. The main cause is reciprocal inhibition - in simple terms, opposing muscle groups hold tension making movement shorter, slower and more demanding to perform. This can be addressed by slowing the movements right down and gradually increasing speed and complexity of training until realistic speeds are achieved. The speed can be ’nudged’ a little faster over time gradually improving performance. Again, slow training is the perfect medium to start this process. Moving at perhaps 25% of your potential speed may feel strange at first but quickly you realise what can be achieved at a relaxed 25% means you can deploy energy efficient techniques in real life and not panic if you do get hit back. Slow fighting will adversely effect your training. This is an old gem, it’s also utter nonsense. Slow fighting is a great method of skill acquisition and stress inoculation BUT it must progress to faster training to be realistic. Again, slow fighting should not be an excuse to introduce impractical, complex techniques - remember the goal is build foundations for faster, more realistic training - not to look like something from the matrix. It’s natural for people to be competitive and to speed up. Its also not very beneficial in this instance. Set the ground rules - slow means slow, don’t speed up just to get one over on your partner - they then speed up and the opportunity to learn has now gone. Its slow fighting - a skill drill, not a fight. Work together help each other skill accelerates with co-operative training. Make deliberate mistakes to give the other Kravist opportunities, the work out how to counter that. The Gracies use similar methods “Fight Rehearsals’ and they are highly successful in the octagon - so the technique works. In slow fighting, it is the better Kravists job to slow down and control the pace, its not the job of the less experienced Kravist to keep up. Touch contact only, negative stimuli interferes with fast learning. Pain and impact come at the appropriate time - pressure drills and fighting practice. Tension is the enemy. Relax, if you get tense, tell your partner to slow down. Remember always coach to success. It’s skill training, skill training is inhibited if not completely stopped when combined with heavy exertion. 6. Slow is smooth and smooth is fast. Work slow and smooth. Speed comes later. Slow fighting simply builds the foundations. Identify weaknesses, work on them. Slow the training down and coach each other to success. Talk to each other - it’s co operative. Tell each other to slow down, ask for repeats if you can’t manage the counter - ask for a slower attack. Work together - it makes for faster learning. Remember, whilst slow fighting is a highly effective training tool it is only a training tool and should not be thought of as realistic fighting. Done well, slow fighting can improve your Krav Maga in ways that are not easily replicated elsewhere. When it comes to rapidly improving skill and fluidity in Krav Maga, slow fighting is unparalleled as a training method. Dome poorly, it can reinforce or ‘train in' complex and impractical techniques that have no place in real world Self Defence.